So I'm going to Laguna seca 90 db limit and thunder hill 103 db limit with my race car. It is a 12a large port, currently open exhaust coming right out of the bottom of the engine. What can I do to make it pass the db limit tests? I'm aware that making the exhaust exit to the left is better because they test the db's from the right from 50 ft away. Right now I have access to a stock fc exhaust that I could have an exhaust shop modify and help me with. Could I use one of these stock mufflers with maybe a baffled or silencer or something? both tracks have sound on drivers right. thunderhill is right around the flag stand. with the rotary we always had luck using the RB turbo back presilencer REV TII Presilencer for 87-91 RX-7 TURBO II - Racing Beat into whatever in the rear. we got it down to the mid 90's. Racing Beat mufflers are the way to go. Even without the presilencer my car passed without issue at MRLS. Open exhaust near the firewall? How is it possible that you have any hearing left? I'm not even 40 yet and my hearing is half gone. Do you think this would be more quiet than the Racing Beat universal 3 inch pre silencer? I have a tough time making sound at AMP, that is the most strict track I know of here in the southeast. My sand drag car is abit different than any of yours, But I have the same challenge. My motor is mounted sideways with a sno-mobile clutch drive. That allows my header to run straight off the motor. 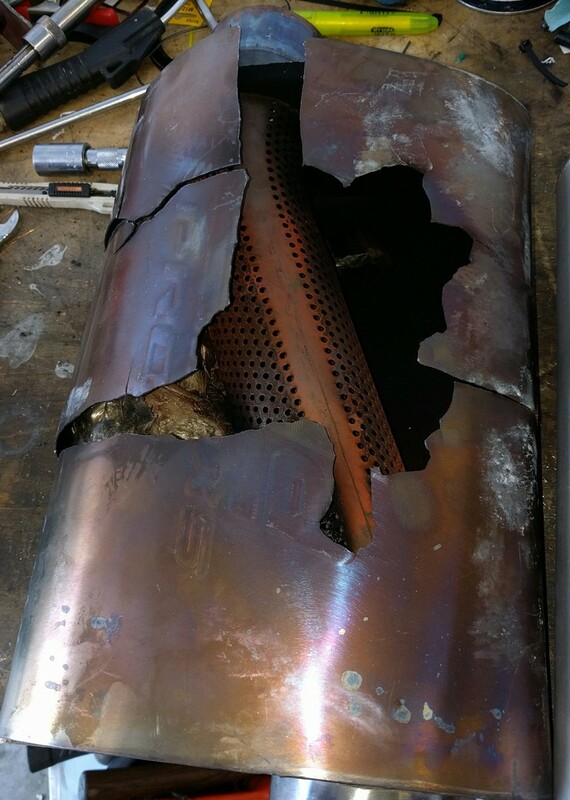 For the bridge-ported motor, I bought a pair of cheap cherry bomb mufflers, cut them apart to get the perforated core, inserted that into the exhaust pipe where it exits the header flange. Did the same at the end of the pipe and also added a baffled tip. For the combi P-port/B-port motor, I added a pair of mini mufflers and when we built the header we aimed the tip of the exhaust into the rooster tail of dirt coming off the rear tires to get any extra bit of silencing we could. Our "noise" is measured at the property line and has to be under 60Db. That article recommends using Borla mufflers, here is my results of 7hrs with a Borla. There were extenuating circumstances in this case, I had a misfire at a certain rpm and was getting backfiring but the stainless on a Borla is a lot thinner than on the Magnaflow that I am running now. ....but which one is lighter? Borla now makes a rotary specific muffler. It works very well on my 1st gen 13B peripheral port IMSA GTU vintage road racer. It is very unique - it has 4 tubes in the straight thru core. I can't access the Borla site right now to get you their part number, but it is a Borla XR-1 Multi-Core muffler. It has held up to about 10 hours of severe peripheral port heat so far. The Mazda lava rock mufflers are too heavy. I've also had luck with the Magnaflow. On my stock port 12a. I only lost 3hp with a 17" round (premuffler) & 17" Oval. And Under 92dbl. Looking at Borla's website, the rotary specific mufflers are 40037x part numbers. Four different models. Summit carries all of them for 30-50 bucks less.